Opal was first discovered in Mezezo, Shewa province in Ethiopia in the early 1990's. Many of the Mezezo opals had a darker body color, tending to orange to red to chocalate brown. The latest Ethiopian opal find was in 2008 in Welo province in northern Ethiopia, about 550 km north of Addis Ababa. Local farmers discovered some high quality opal near Wegel Tena close to the top of a plateau at 3,500 meters altitude. Much of the opal has a white body color with a vivid play-of-color. The Wegel Tena find appears to be a very significant one, with an unusually high proportion of gem-quality material. Even though the miners are using rudimentary mining techniques over 1,500 kg of opal rough have already been extracted. The new Ethiopian opals range from opaque to translucent, but most of the high quality pieces are translucent. They display a full range of colors against a translucent white body color. Large patches of red and orange are common, and play-of-color is sometimes distributed along parallel colums that resemble fingers. 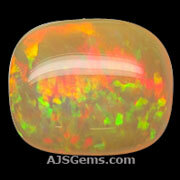 When immersed in water for a short period -- a few minutes to an hour -- many of these opals become quite transparent. This is typical of hydrophane opal, which is dry and porous and can absorb water without any damage to the stone and sometimes with no appreciable affect on the color flash. It is fascinating to watch this opal become completely clear when immersed in water. The process is fully reversible within a few hours, depending on the humidity and thickness of the opal. This phenomenon is prized by collectors. According to a recent article in the GIA journal Gem and Gemology, the Wegal Tena opal "are resistant to crazing, and are remarkably durable." However, because the hydrophane opal is quite porous, we recommend avoiding exposure to chemicals or cosmetics. Opal in general requires care, and the Ethiopian opals are no exception. For more information on opal care, see our article on How to Care for Your Opal Gems. Because there is currently a good supply of the Wegal Tena opals in the market, prices are attractive. 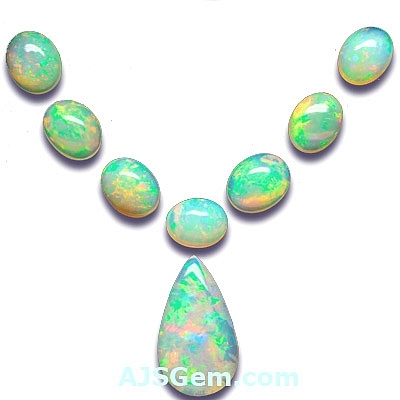 In fact Australian opal has begun to feel pricing pressure and we see that some Australian dealers have started selling the Ethiopian opal as well as their native stones.